Call us or book online Movers in Inver Grove Heights , Minnesota. 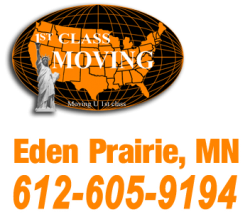 1st Class Moving providing moving service in Inver Grove Heights, MN. We are committed to efficient, safe and simple moving experiences for our customers. whether small or big moves our customers can expect and receive professionalism, care and value. Call us to schedule your move in Inver Grove Heights, MN.